In 1999, we published David Bush’s account of a Civil War prison on Johnson’s Island in Ohio (“Doing Time” July/August), followed by our online exclusive featuring stories, photographs, and diaries provided by descendants of prisoners (“Tales From A Civil War Prison“). Our collaboration has continued ever since. ARCHAEOLOGY joined Bush and his crew in 2002 as they headed into the field to excavate barracks that once housed Confederate POWs. We returned to Johnson’s Island in 2006, 2007, and 2008 to follow investigations of the prison hospital, where work continues in 2009. 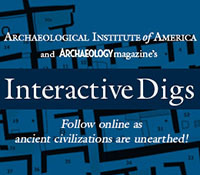 In addition to our Interactive Dig, see www.archaeology.org/johnsonsisland/ for interviews, online features, and a video tour. David Bush joined Heidelberg College’s Center for Historic and Military Archaeology in 1998 to focus exclusively on the Johnson’s Island Prisoner of War Depot. He is also chairman of the Friends and Descendents of Johnson’s Island, a nonprofit organization dedicated to the preservation of this National Historic Landmark site.